A small but well-timed gesture of support can go a long way. At Hats for Hope, a local charity, that is the guiding philosophy it follows when helping Central Coast residents with cancer. Hats for Hope’s singular mission is to provide free wigs, hats, and other head coverings to people in cancer treatment. 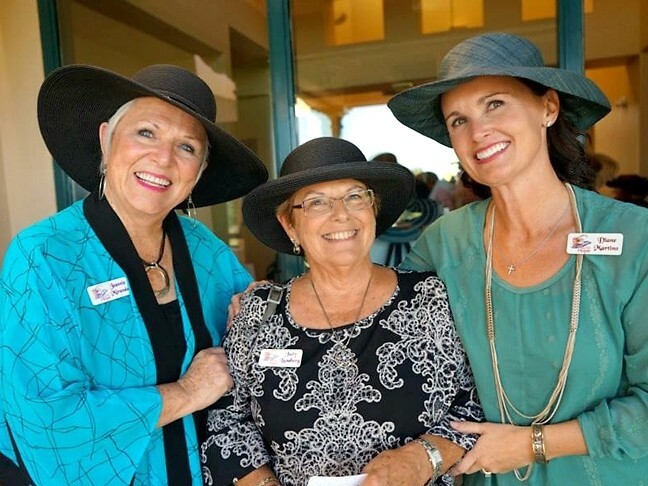 WIGS AND HATS: Co-founders of Hats for Hope, Jeannie Miranda (left) and Judy Lundberg Wafer (center), and board member Diane Martino (right) will host their annual fundraising event on Oct. 11, which will generate thousands of free head coverings for Central Coast residents in chemotherapy. While a cancer diagnosis is life-changing in countless ways, the hair loss can be one of the most daunting prospects, said Diane Martino, a Hats for Hope board member. Hats for Hope funds the gifts through an annual event, which is coming up on Sunday, Oct. 11, at the San Luis Obispo Country Club. Tickets are $50, and all the proceeds go toward the delivery of wig certificates to oncology offices across the Central Coast, “from Santa Ynez to Paso Robles.” Hats for Hope is able to provide up to 4,000 certificates every year. The wig certificate, worth $200, is automatically included as part of chemotherapy treatment packets, where patients can then redeem them at stores in Templeton, Grover Beach, and Santa Maria. “People don’t have to ask for it; they don’t have to apply for it; it’s a gift,” Martino said. Retaining a sense of normalcy during cancer treatment can be extremely difficult, and hair loss is one side effect of the treatment that can make living normally that much harder. A wig or hat could be a crucial resource for people who are in chemotherapy and want to avoid attracting special attention. A head covering comes in handy during simple, everyday situations, like walking with your children to school. “I had one of our recipients say she felt so grateful that she had a wig, that she could just throw it on and take her kids to school like everything’s OK,” Martino said. The gift also brings relief and recognition to the financial burden of cancer. In one tale of a recipient’s gratitude, Martino said a woman became overwhelmed with appreciation when after an uplifting experience being fitted for a wig, she realized afterwards that it wouldn’t cost her a penny. Founded in 2001, Martino joined the organization 10 years ago to honor her late grandmother who died of cancer. “Everybody on our board has been touched by cancer in some way or another,” she said. The Oct. 11 event will include wine and beer, appetizers, and music, in addition to a raffle and live auction, with items ranging from local art to a vacation to Mexico. Book your ticket in advance online at hatsforhope.com or send an email to info@hatsforhope.com. Go to Mission Plaza on Saturday, Oct. 10, to participate in the third annual Out of the Darkness Walk for suicide prevention at 10 a.m.
Peter Johnson wrote this week’s Strokes and Plugs. Send your business and nonprofit news to strokes@newtimesslo.com.